Happy it’s almost Valentine’s Day, everyone. Of course, it isn’t actually almost Valentine’s Day, but just like Walmart, I’m going to pretend it is. Because we all know we need at least a full month to prep for any holiday, right? 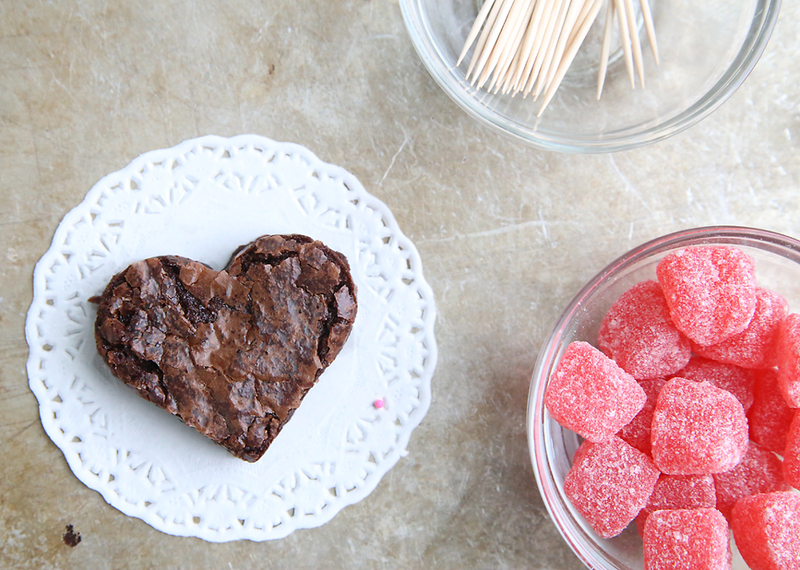 Anyway in honor of it being just over a month away from V-day, I’m showing you how to make heart shaped brownies with cupid’s arrows through them. 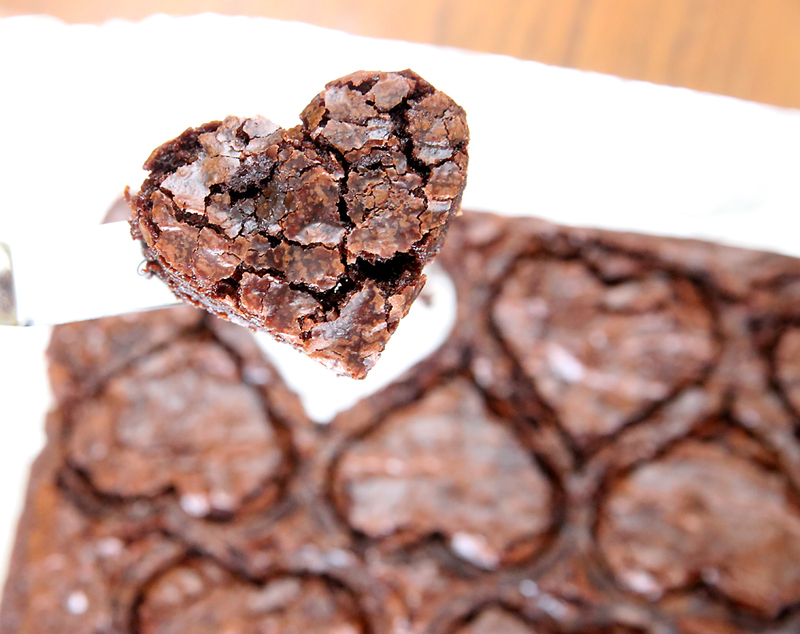 Or as I like to call them, shot through the heart brownies. 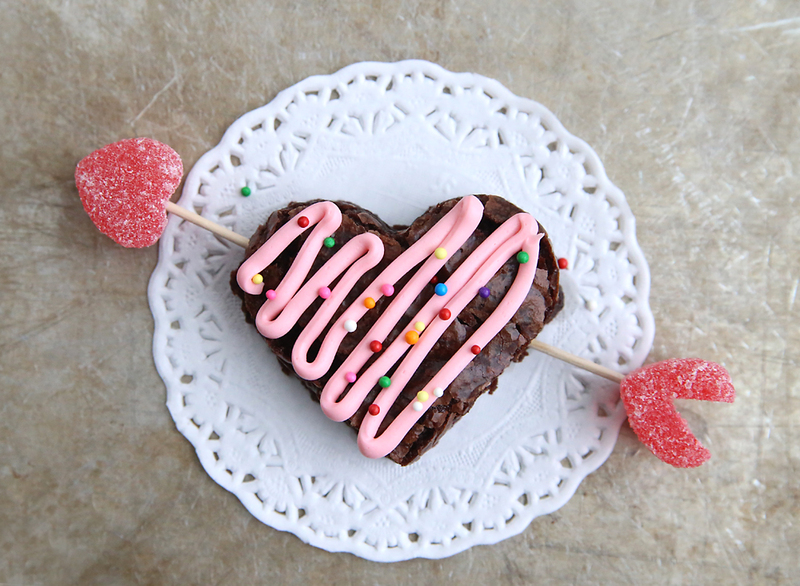 To make them, you’ll need brownies, a heart cookie cutter, toothpicks, and heart shaped gummy candy. Line a 9×13 inch baking pan with aluminum foil and spray it with nonstick spray. 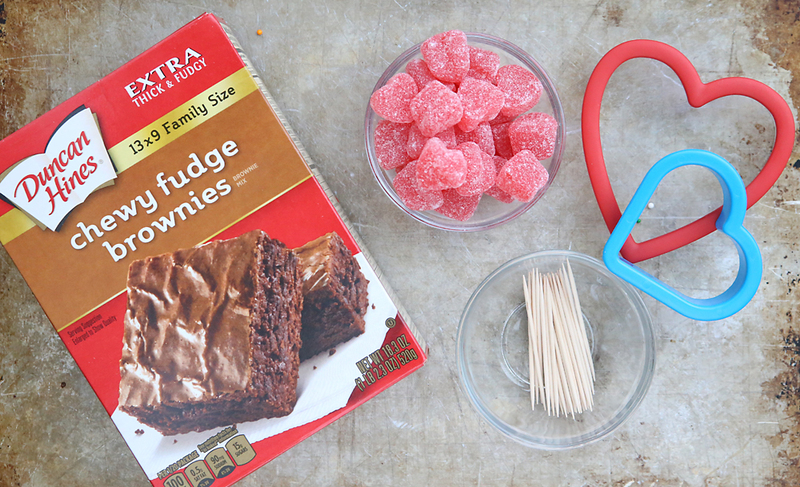 Mix up the brownie mix as directed, pour into the pan, and bake as directed. Allow the brownies to cool completely. When the brownies are cool, use the aluminum foil to lift the brownies out of the pan. 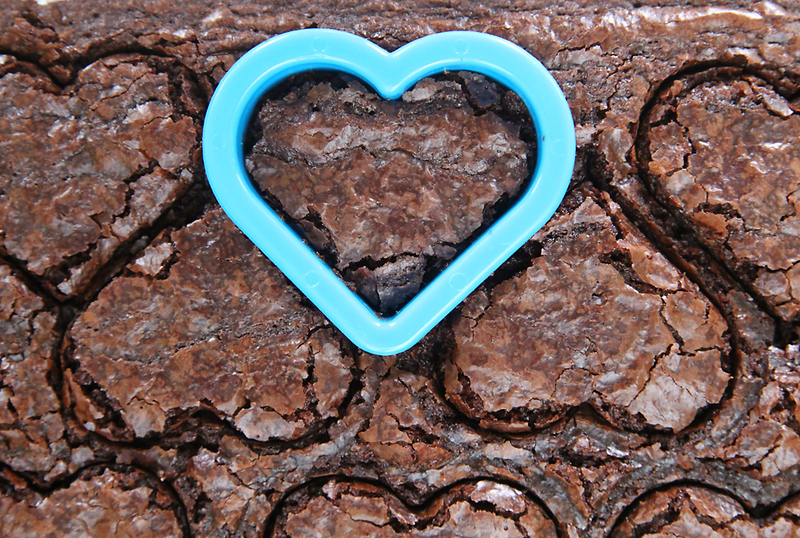 Use a heart shaped cookie cutter to cut out as many hearts as you can fit. The one I used was just under 3 inches wide and tall, and I was able to get about 14 hearts. Use a spatula to lift each heart away from the foil. 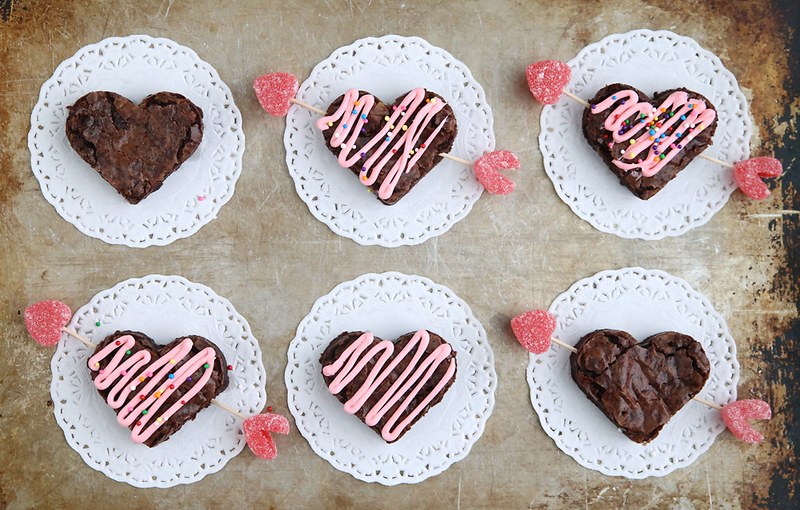 And then place each heart on a small doily or a flattened out cupcake liner. Then put one gummy heart on a toothpick to make the point of an arrow. Cut a triangle out of another gummy heart and place it on another toothpick to create the end of the arrow. Push both toothpicks into the heart. Then, if you’d like, put some frosting into a sandwich baggie and snip off a corner, then pipe the frosting onto the brownie and add sprinkles. These are so cute and such a great idea! I was about to pin them when Pinterest reminded me I’d already pinned them over and over to my Valentine’s board. haha Hope you have a great Valentine’s! This looks so cute! 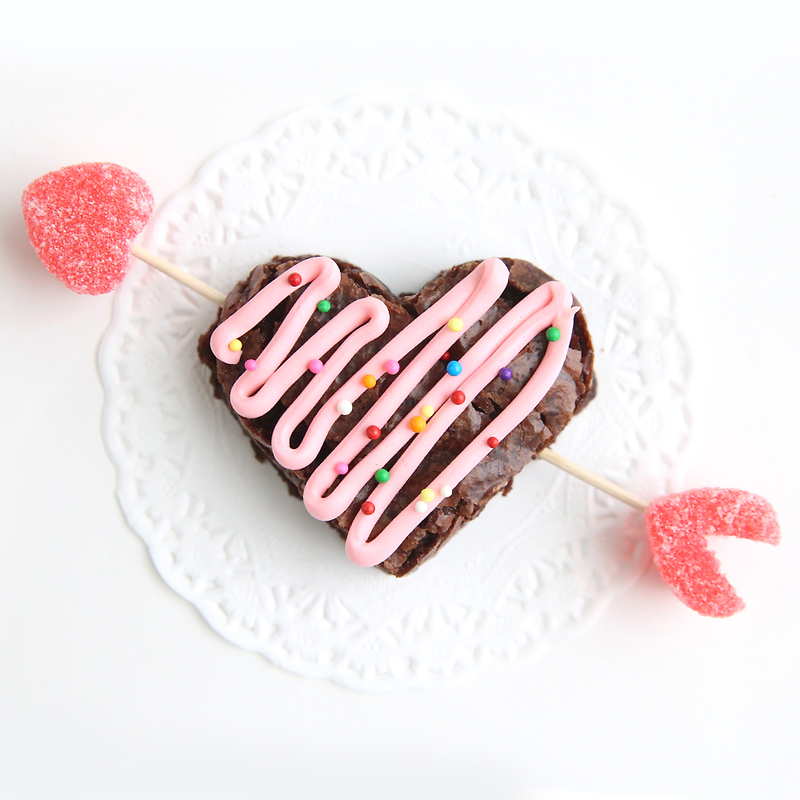 I can’t wait to make it for my kids’ Valentine’s Day school party. Will it be okay if I used store bought frosting?? Thanks. These are so cute! I just found your website and I love it!